American Indian elders are valued members of their communities. Based on the projected increase expected in the number of American Indian elders in the near future, there will be a need for more long-term care options for American Indian people. Elders prefer to remain in their own home and community settings, that is, they prefer to “age in place.” Because the Indian Health Service is not designed to provide long-term care services, the time for pro-actively building effective Home & Community-Based Services (HCBS) for American Indian elders is now. Development of the Native Elder Caregiver Curriculum has been guided by an awareness of Tribal reservation communities, as well as a mindfulness of the historically rich traditions and strengths of American Indian nations. Many improvements are needed at local, regional, and state levels to provide the support needed for HCBS and these issues are discussed in the curriculum. Strengthening the role of Community Health Representatives (CHRs) is one focus of the program. But the most critical link in caring for elderly family members remains the support of family caregivers. 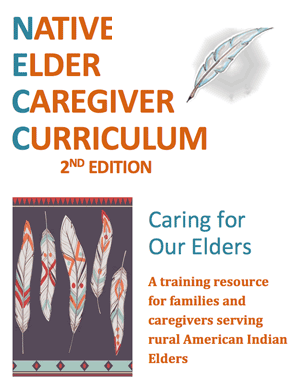 The Native Elders Caregiver Curriculum is a tool to assist family and community members, as well as CHRs, who have the responsibility of caring for their elders. It is dedicated to these caregivers and their values of respect, generosity, compassion, and fortitude. We hope it will empower these special people with some of the information they need to carry out their sacred work. The curriculum was developed through a collaboration between National Resource Center on Native American Aging (NRCNAA) and Cankdeska Cikana Community College, with special input from elders and community members of the Spirit Lake Nation. If you're interested in offering a course at your location, please contact NRCNAA at (800) 896-7628. The Native Elder Caregiver Curriculum is copyrighted property of the National Resource Center on Native American Aging. For usage rights, please contact NRCNAA.